Open Catapult Data Before After Improvement.xlsx. Click Sheet 1 Tab. This data set contains Catapult firing distances. Before_After denotes before improvement and after improvement. The target distance is 100 inches, with the goal being to hit the target and minimize variation about the target. We would like to use an individuals control chart with historical groups to split the limits demonstrating the before versus after improvement. 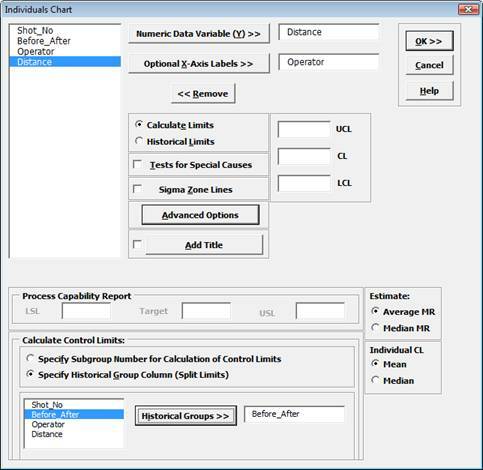 Click SigmaXL > Control Charts > Individuals. Ensure that entire data table is selected. If not, check Use Entire Data Table. Click Next. Select Distance, click Numeric Data Variable (Y) >>; select Operator, click Optional X-Axis Labels >>. ClickAdvanced Options. Select Specify Historical Groups. Select Before_After, click Historical Groups >>. Note: Process Capability analysis is not permitted when Historical Groups are used.